Succesful vivas for Barrientos, Ghadgoud, Kauhanen, McDermott and Stampone! We know. It’s been far too long since we gave you an update on which of our talented PhD students have passed their viva. If you thought there were none, boy are you mistaken. On October 26th, 2017, Victoria Stampone (currently a lecturer at Italian studies at UoM) passed her viva with a dissertation called ‘The microvariation in passive and impersonal constructions in Italo-Romance dialects of Italy’. Her LEL supervisor was Delia Bentley. On December 4th, 2017, Fernanda Barrientos Contreras (currently in Konstanz) graduated with her dissertation on vowel perception in L2, supervised by Wendell Kimper and former LEL staff member Yuni Kim. 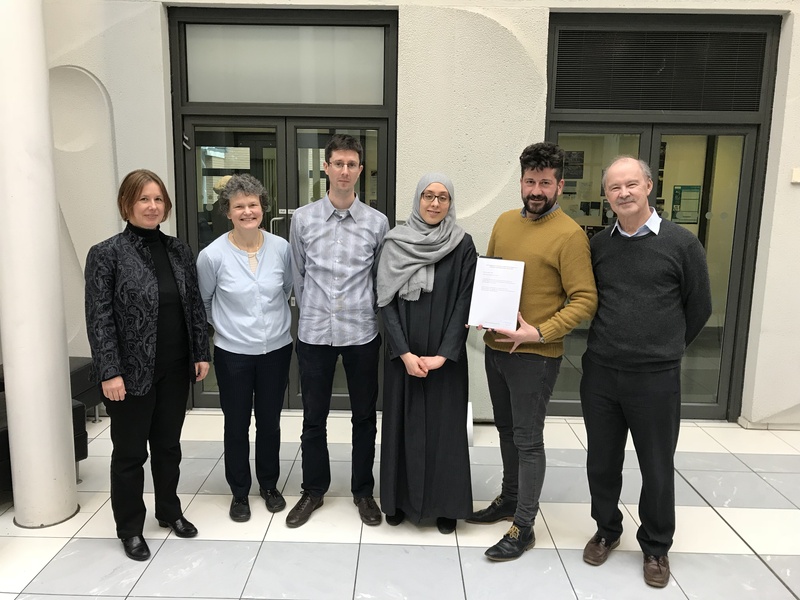 Not much later, Luke McDermott passed his viva on December 8th 2017. His dissertation is called ‘An investigation of the spatial semantics of Chiapas Zoque, a Mixe-Zoquean language of southern Mexico’ and was supervised by Eva Schultze-Berndt and Yuni Kim. In January, Khawla Ghadgoud (the star of the featured image) graduated with her dissertation on ‘Negation patterns in Libyan Arabic and Modern Arabic varieties’. Her supervisors were Kersti Börjars and John Payne (also pictured in the featured image). And, last but certainly not least, Henri Kauhanen (also currently in Konstanz) passed his viva with a shining ‘no revisions’. Kauhanen’s dissertation is called ‘Neutrality, Biases and Social Network Effects in Language Change’ and was supervised by George Walkden and Ricardo Bermudez-Otero.